Bioretention areas, or rain gardens, are landscaping features adapted to provide on-site capture and treatment of stormwater runoff. They are commonly located in parking lot islands or within small pockets of residential land. 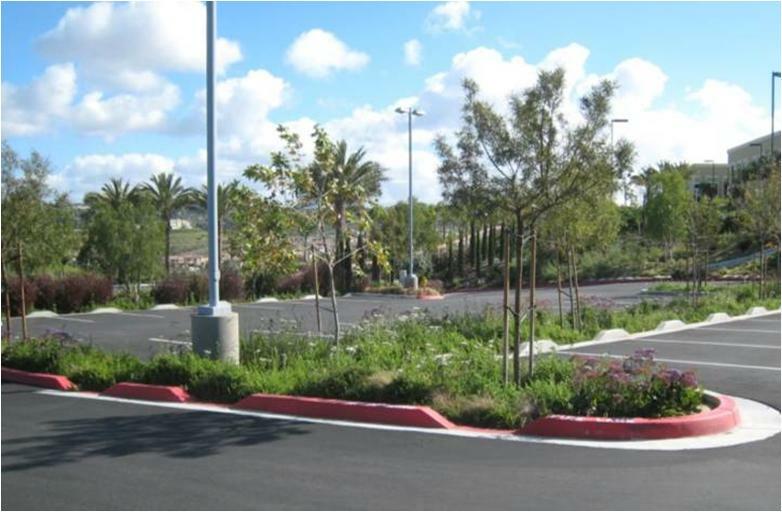 The surface stormwater runoff is directed into the shallow, vegetated depressions, which increase stormwater storage, filtration, and pollutant reduction. These bioretention depression areas are designed to mimic many of the pollutant removal mechanisms that operate in natural ecosystems. An excellent resource for rain gardens, including design and rain garden plants recommended for Western Pennsylvania is the Three Rivers Rain Garden Alliance website, http://raingardenalliance.org/. 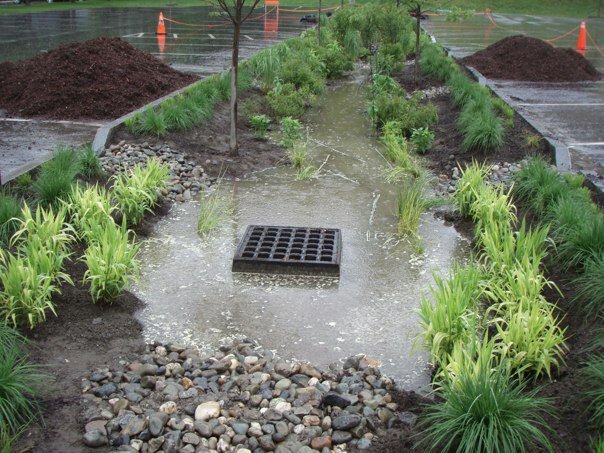 During storm events, stormwater runoff travels as sheet flow or via a curb cut to the bioretention treatment area, which usually consists of a grass buffer strip, sand bed, ponding area, organic layer or mulch layer, planting soil, and plants. As the runoff passes over or through a sand bed, the runoff's velocity is slowed allowing the stormwater to be distributed evenly along the length of the ponding area. The bioretention area is graded to divert excess runoff away from itself. Water stored in the bioretention area planting soil exfiltrates over a period of days into the underlying soils. 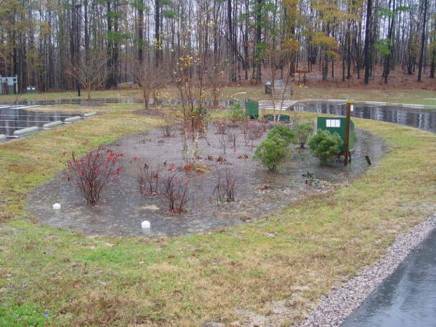 Runoff from larger storms is generally diverted past the facility to the storm drain system. The remaining runoff filters through the mulch and prepared soil mix. The filtered runoff can be collected in a perforated underdrain and returned to the storm drain system. Pruning 1-2 times/yr Nutrients in runoff often cause bioretention vegetation to flourish. Mowing 2-12 times/yr Frequency depends on location and desired aesthetic appeal. Mulching 1-2 times/yr Between 1"–3" of mulch depth is ideal. Mulch removal 1 time/2–3 years Mulch accumulation reduces available water storage volume. Removal of mulch also increases surface infiltration rate of fill soil. Watering 1 time/2–3 days for first 1–2 months; Sporadically after establishment If drought conditions exist, watering after the initial year might be required. Fertilization 1 time initially One time spot fertilization for first year vegetation. Remove and replace dead plants 1 time/year Within the first year, 10% of plants can die. Survival rates increase with time. Inlet inspection Once after first rain of the season, then monthly during the rainy season Check for sediment accumulation to ensure that flow into the bioretention is as designed. Remove any accumulated sediment. Outlet inspection Once after first rain of the season, then monthly during the rainy season Check for erosion at the outlet and remove any accumulated mulch or sediment. Homeowner-installed rain gardens will probably cost less than the costs reflected here (up to 20% less).